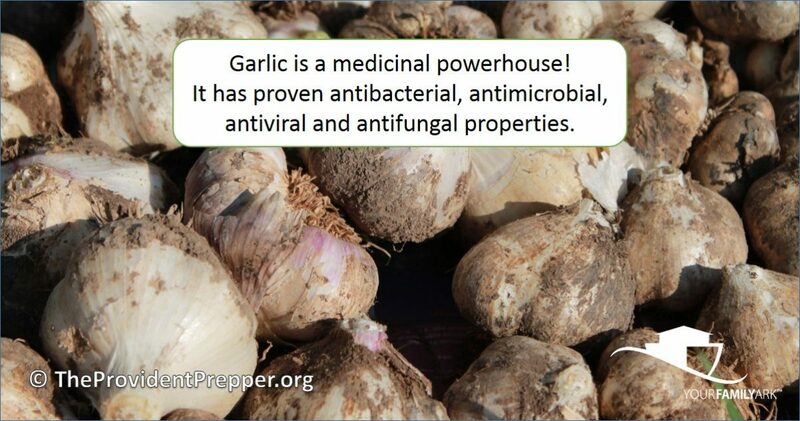 Garlic is a miracle plant no home should be without! Here are 4 reasons why you should not waste any time incorporating garlic into your landscape. #1 – Garlic is a medicinal powerhouse. It has proven antibacterial, antimicrobial, antiviral and antifungal properties. These medicinal properties will boost the immune system and improve health. Talk about a cure-all, garlic is it! 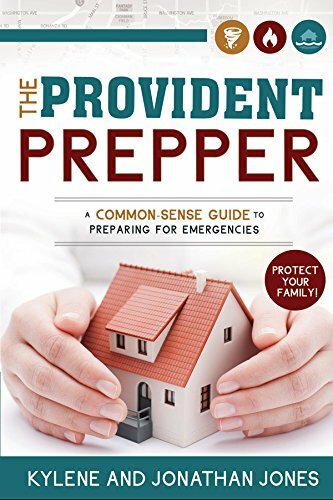 Do a little research and discover just how valuable a commodity garlic is and you will definitely want to grow some to live a healthier today and be prepared in the event modern medicine becomes unavailable. #2 – Garlic is a magnificent companion plant in the garden. Tomatoes, potatoes, carrots, eggplants, kale, spinach, lettuce, parsnips, beets, sweet peppers, cabbage, cauliflower, broccoli, kohlrabi, dill, savory, chamomile, strawberries and fruit trees are all benefited when garlic is grown nearby. Don’t be afraid to tuck a few throughout your garden. Avoid planting garlic near asparagus, parsley, peas and beans. 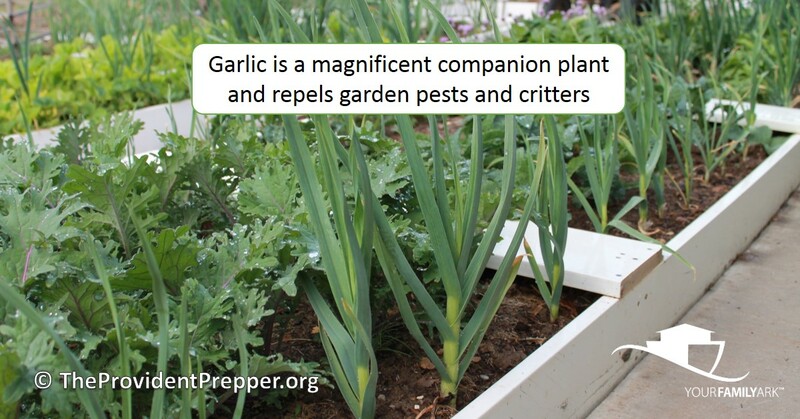 Garlic repels a variety of pests including; spider mites, cabbage loopers, Japanese beetles, aphids, ants, onion flies, fungus gnats and codling moths. 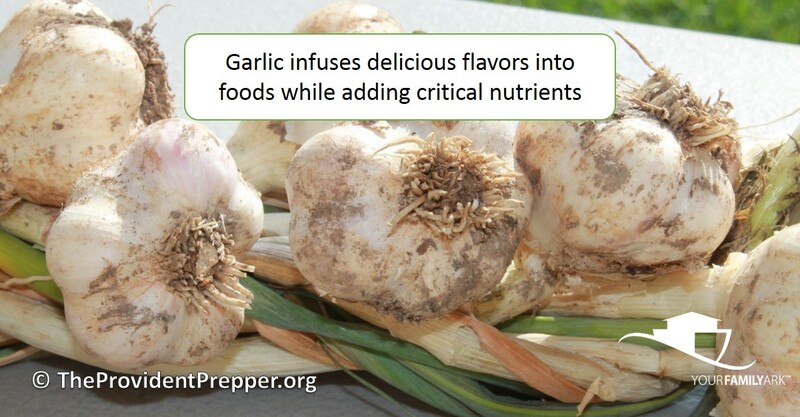 Garlic also discourages critters like rabbits and deer. That means you can harvest a successful crop without the need for chemicals. #3 – Garlic is highly nutritious and is a source of manganese, vitamin B6, vitamin C, copper, selenium, phosphorus, calcium and vitamin B1. Garlic is a popular ingredient in many recipes because of its delightful flavor. Nutritious and delicious, what more could you ask for? 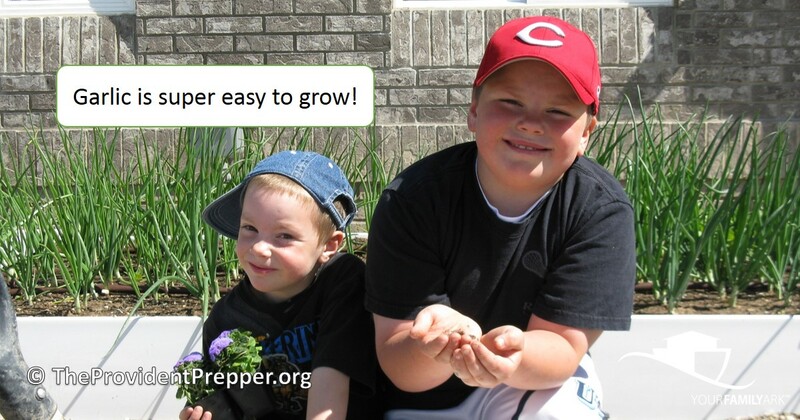 #4 – Garlic is incredibly simple to grow and will store well for about 6 months. Garlic is a very forgiving crop. 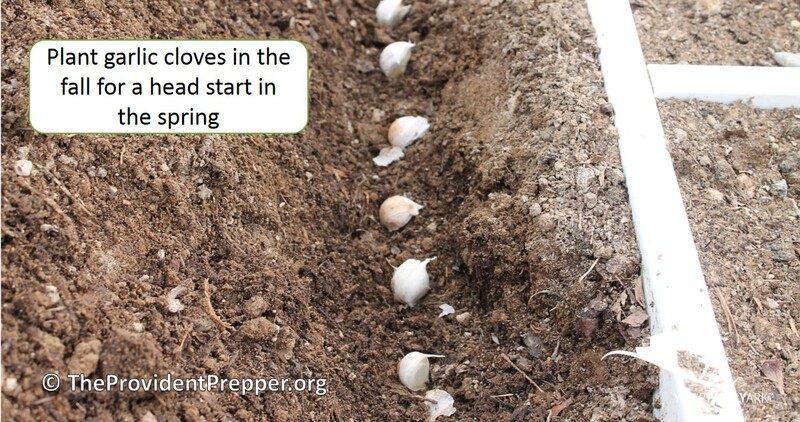 Traditionally, garlic cloves are planted root side down 1-3 inches deep and 4-6 inches apart. Inevitably our fall harvest will leave several bulbs behind which sprout in the spring in clusters. I just dig up the cluster and separate the individual plants. They are then strategically placed in my spring garden with the rest of the spring veggies. 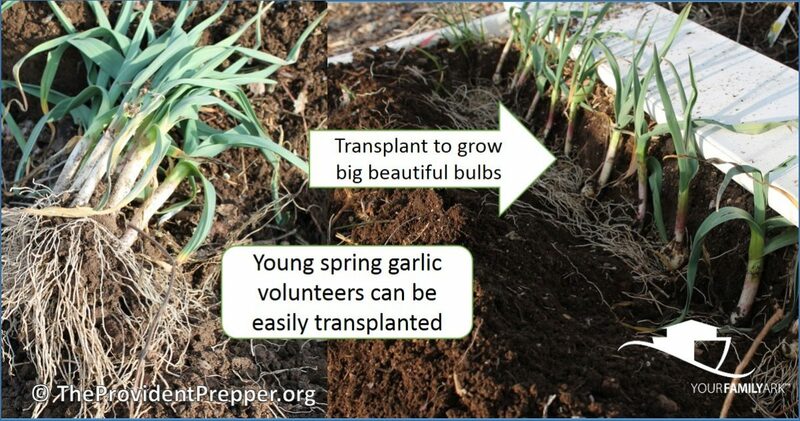 To transplant in the spring, just water the volunteer garlic well and then gently dig up a clump. Separate and plant each individual plant. Water the new transplants well. 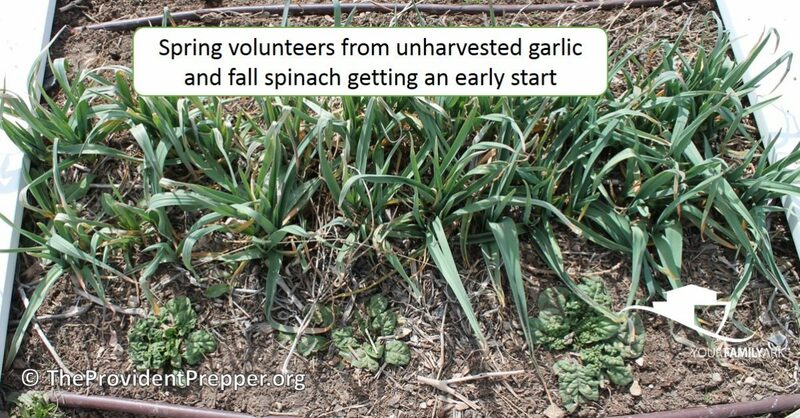 Garlic is harvested in the fall when the tops of the plant start to turn brown. 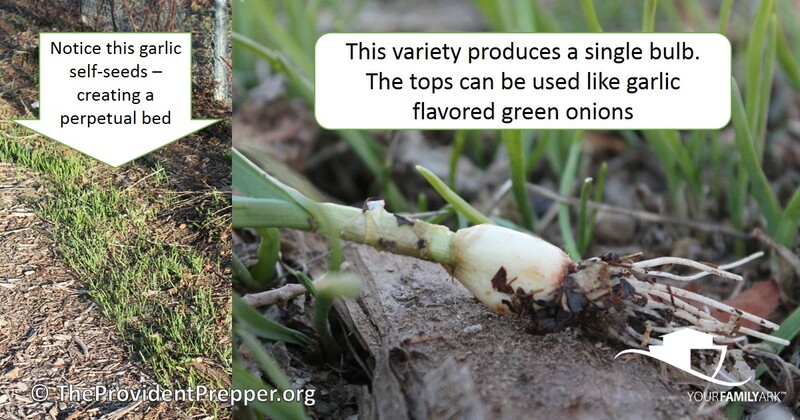 I usually snap off the garlic scape (green stock with a flower) to produce larger bulbs. The scapes add a delicious mild garlic flavor to recipes. 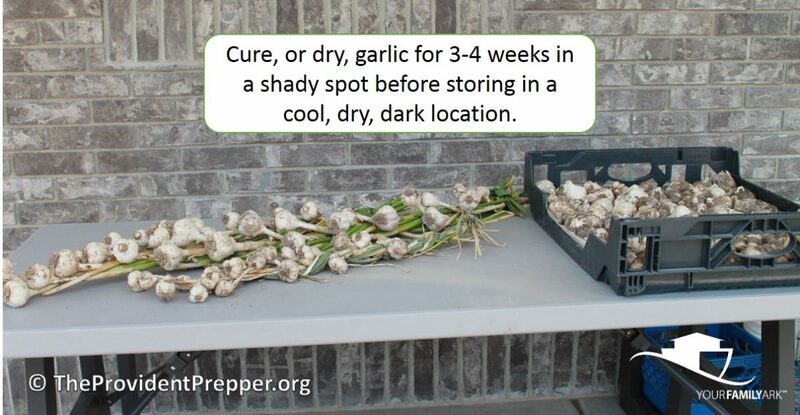 Brush the soil off of the garlic and allow garlic to cure for 3-4 weeks in a shady, well-ventilated area. I like to use the table under our back porch. I clean the bulbs by trimming off the roots and brushing a bit more of the dirt off again before storage. It is really fun to braid the long stems shortly after harvesting. I have found permaculture guilds to be an effective way of producing healthy, organic produce. It is like companion planting on steroids. I planted a few garlic bulbs that a friend gave me from her yard in with my blackberries and fruit trees. This variety produces a single clove with a delicious edible stock. They went to seed and look at the crazy amount of new little garlic plants that sprouted without any effort on my part. This is a fantastic way to have a perpetual bed of garlic with very little work. There are several types and hundreds of varieties of garlic to choose from. I love the elephant garlic because the giant size cloves are easy to peel. All my garlic has been grown from starts my fellow gardeners have shared, but the seed catalogs are full of fun options. Garlic can even be grown in pots inside the house or out. No excuses! Remember the best source for an abundant supply of this miracle plant is in your very own yard.